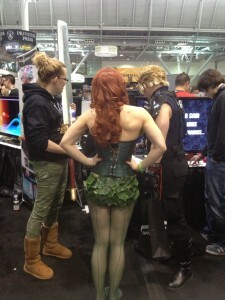 You meet a lot of people at PAX. You expect that. But you don’t expect to meet a lot of puppets. 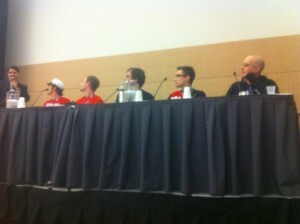 That’s what makes this one of my favorite interviews at PAX. 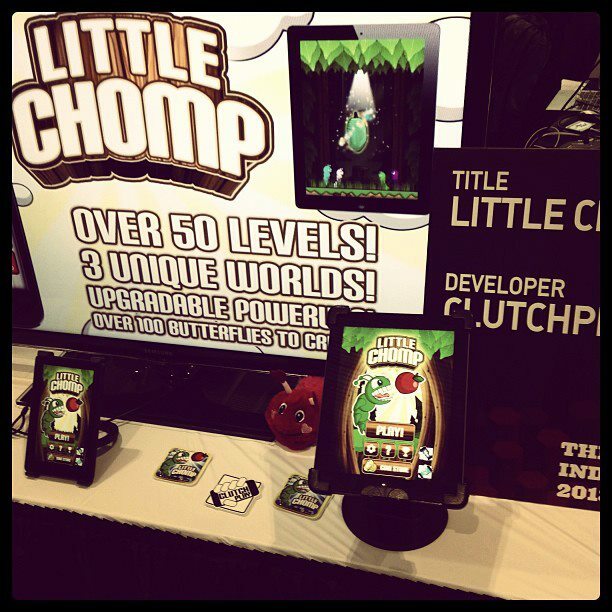 Here, John and I talk about Little Chomp with Ditto P. Monster, a ‘fabricated American’ gamer who blogs about games for kids. This entry was posted in Blog, Events, Games, News on March 29, 2013 by Amy Dallas. 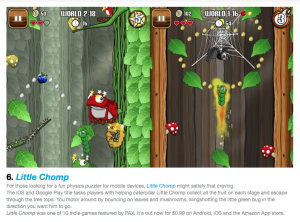 Little Chomp makes Mashable’s 10 Best Indie Games at PAX East! 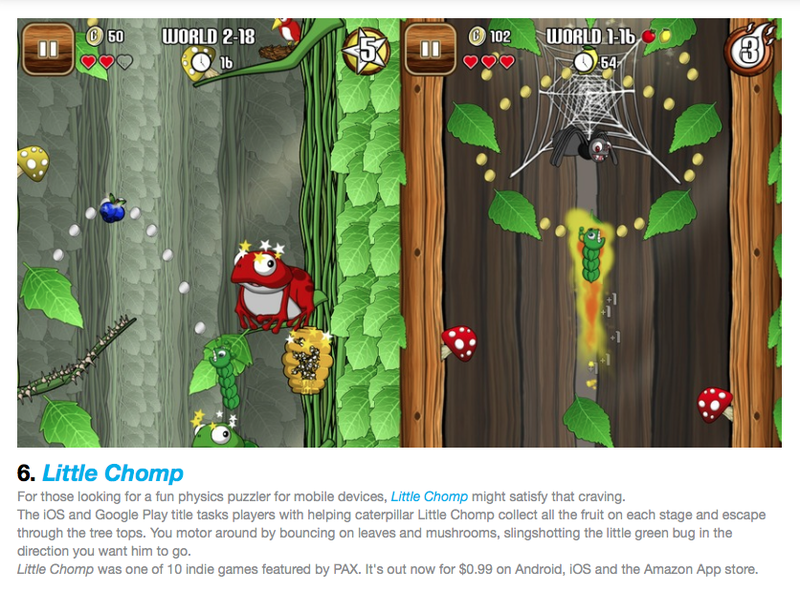 Mashable’s Chelsea Stark names Little Chomp as one of the 10 Best Indie Games of PAX East 2013. Wow, what an incredible honor! This entry was posted in Blog, Events, News, Reviews on March 29, 2013 by Amy Dallas. I can honestly say, with no exaggeration, that I have never been more tired than I am today. As a small indie company without an office, we spend most of our days alone in our respective homes quietly working our tails off. So it’s quite a shock to the system to suddenly find oneself in the middle of a giant convention center surrounded by thousands and thousands of people. Here we are in the calm before the storm. There’s me trying to get pumped up to face the day. John, on the other hand, needs more caffeine before he can get his game face on. They call it ‘the Rush.’ It’s what happens the moment The Enforcers open the doors to the attendees at 10:00 AM. 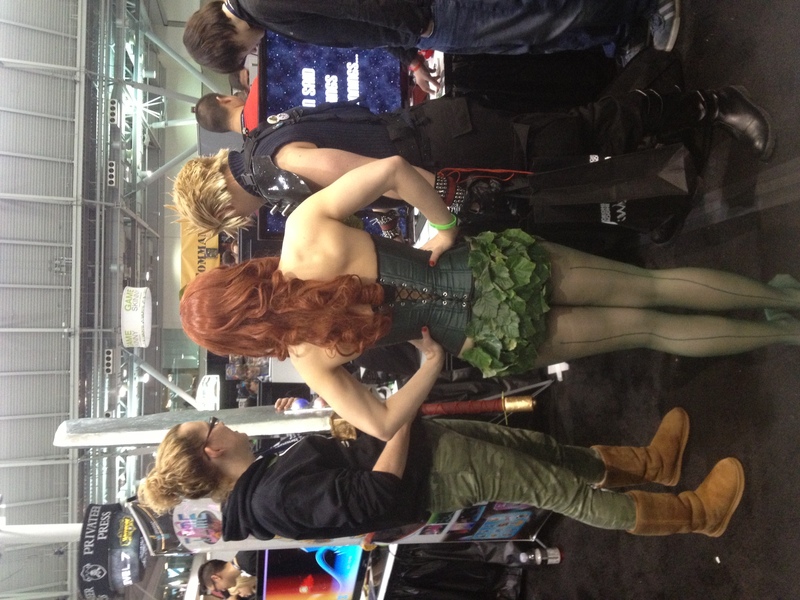 The fans all surge forward and begin running into the exhibit hall shouting at the top of their lungs. Being on the floor when it happens is almost indescribable. You can hear the screaming hoard of people coming at you from somewhere in the distance but you can’t see where they’re coming from at first. It’s more than a little unnerving. It sort of makes you feel like you’re under attack, as though you’re in the midst of some melee battle scene in Game of Thrones. All the other exhibitors seemed to feel the same way. It’s both freaky and exhilarating. Then, moments later, the hall is filled with people. And that’s when the fun begins. 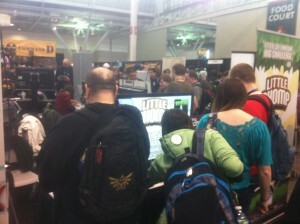 As an indie, you almost never get a chance to watch people play your game. That is the true magic of an event like PAX. 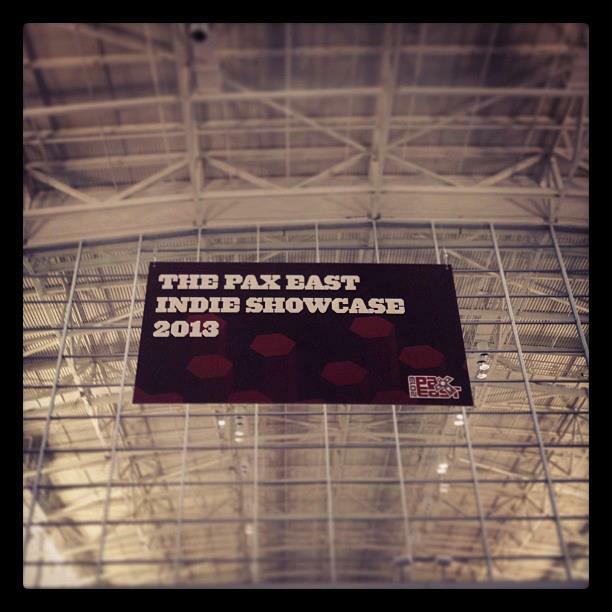 The best part of PAX? Watching people fall in love with your game. It’s also a little bit surreal. There comes a point at which things that might otherwise seem strange begin to seem totally normal. For example, Kira stepped away for a bit and when she came back, she took this picture of me holding a giant paper mache Buster Sword so a Final Fantasy cosplayer could have some quality time with Little Chomp. Now I know why Cloud Stife has such big arms. That Buster Sword is freakin’ heavy! By the time 6:00 comes on Day 1, we’re all exhausted. We’ve been on our feet for the 10 hours straight and we’re sore from standing, hoarse from talking all day and our faces hurt from smiling. But it’s not over yet. We have an exhibitor mixer from 6:00 PM to 7:30 PM and then John is speaking in the Indie Showcase panel that starts at 8:00 PM. John C. Worsley, tired but representing! I don’t know how they do it, but John and the other Indie Showcase panelists somehow manage to be charming and insightful on stage for another hour. I am in awe of all of them. I’m so tired I can’t even seem to take a picture that’s actually in focus. We get back to the hotel around 10:30 or 11:00 but they day still isn’t done, at least not for me. 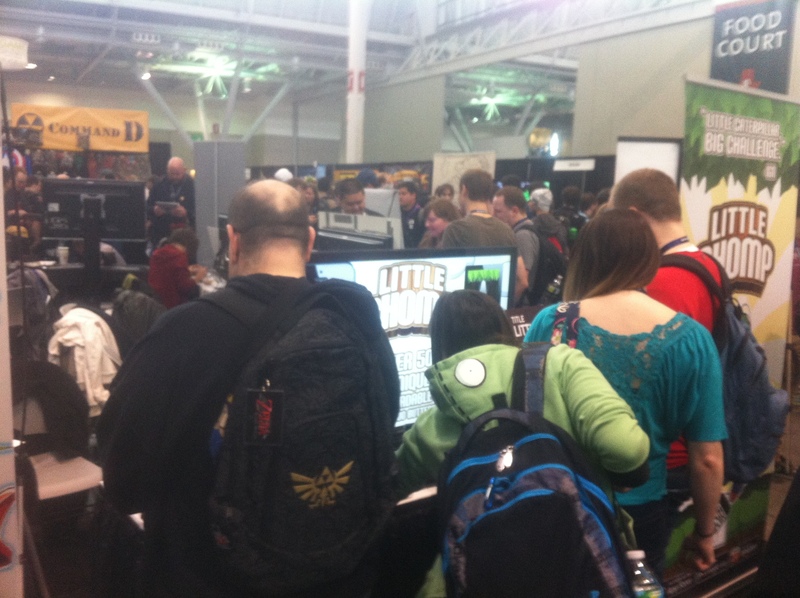 I have emails and promo codes to send to press people who stopped by the check out the game. And then, there’s some blogging to do of course. 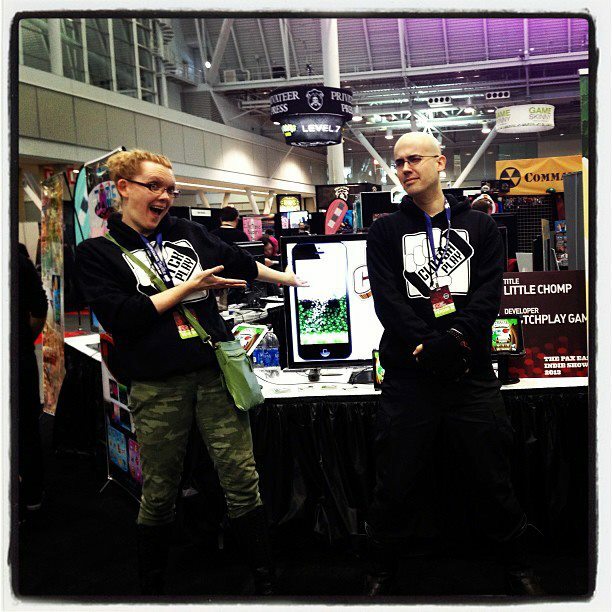 This entry was posted in Blog, Events, Games on March 22, 2013 by Amy Dallas. It was a long day of travel, but we’re finally here at the Boston Convention Center. We have no idea what to expect but if there’s one thing I’m sure of, it’s that this weekend is going to get crazy. The sign above our heads. But we’re more prepared than I thought we’d be. Our at least we look more prepared. Check out our table! We actually look legit! Kind of amazing given how busy our team has been. We’re trying to hit alpha this weekend on our contract gig, which meant that John and I had to wrap up all our deliverables for this milestone before we left. It didn’t leave a lot of time to get ready for PAX so I’m kind of amazed that it all came together somehow. John gets all the credit on that front. He did a brilliant job pulling it all together. Too legit to quit! Our table at PAX. And now we’re off to hit the snowy streets of Boston to get some food and do some networking. Wish us luck for tomorrow! I have a feeing, we’re going to need it! This entry was posted in Blog, Events, Games on March 21, 2013 by Amy Dallas.